Today is a beautiful cloudy overcast day. The temperature is warm and I'm sitting here looking out across this farm remembering. Remembering the little boy buried on the edge of this 40 acres. This time of year is always a time of remembering for me. The dogwood trees are in bloom and there is a huge dogwood tree gently stretching her arms over my little boys grave. So when I turn my eyes toward the east and look through the tree line I can find the place...It's beautiful and I can say that now. It has taken three years for the Lord to show me that William's death was not in vain and His plan is beautiful. I get to share my earthly inheritance with some pretty wonderful people. He has not left me nor has He forsaken me, He has been like a beautiful vase filled with beautiful flowers and I find myself always going back and breathing them in and remembering God set them there. I get to spend hours training, watching and laughing at these little girls who God used to heal my heart and to bless our family. He uses a lot of things to heal us or remind us that He wants us to be happy even during the hard times. 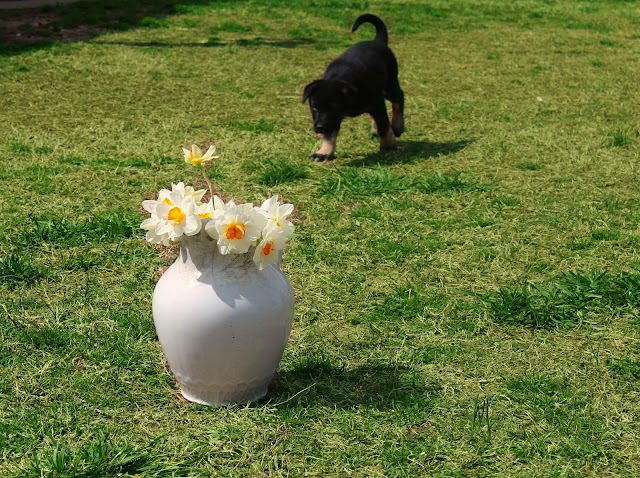 A vase of flowers picked by one of my little guys and he sat them in the middle of the yard?! I started to say, "Cullen move those to the front porch" but before I could everyone started coming over and looking at the flowers and smelling them. Even the dog. When things are out of place people notice. When things happen that shake up your life people take notice of how you handle such times. When you adopt children people notice. When you have a van full of kids people stare. When you choose to stay home and be a wife and mother people wonder. When you homeschool people doubt. When you live your life totally sold out to Christ you will be a vase sitting out of place. has pretty much been sitting in the middle for a while...I love letting people know why we do what we do and who we do it for. 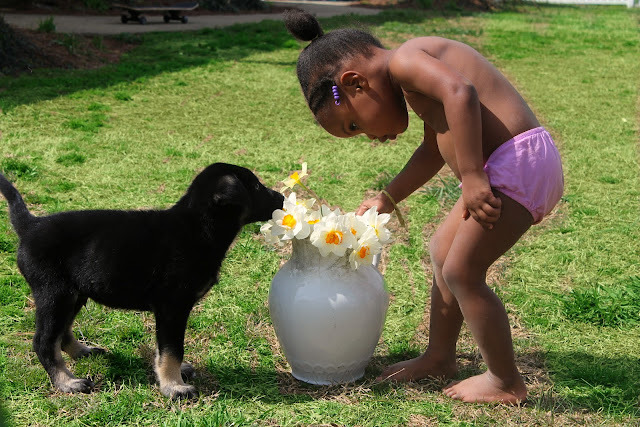 But with a vase filled to the rim with beautiful days and beautiful reminders to enjoy the simple things. Thanks for sharing...I haven't commented in awhile but just wanted you to know I'm still reading and still praying! Thanks for the beautiful reminders. 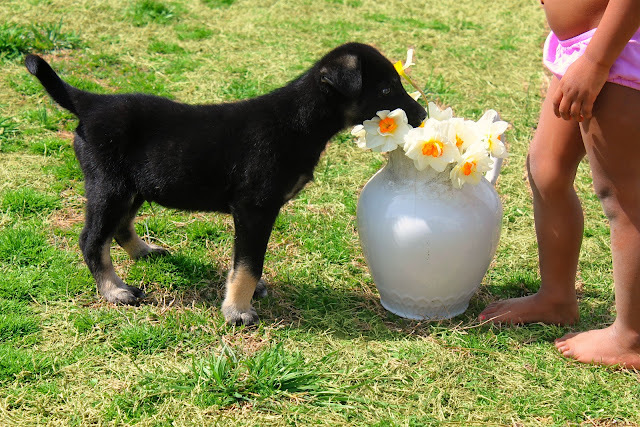 Your girls are growing so quickly & those flowers are beautiful ( daffodils are one of my favourites). God bless you for sharing your heart.